Huntington Ingalls Industries (HII) announced on March 26, 2019, that its Ingalls Shipbuilding division has received a $1.47 billion, fixed-price incentive contract from the U.S. Navy for the detail design and construction of the amphibious transport dock LPD-30. The ship will be the 14th in the San Antonio class and the first Flight II LPD. 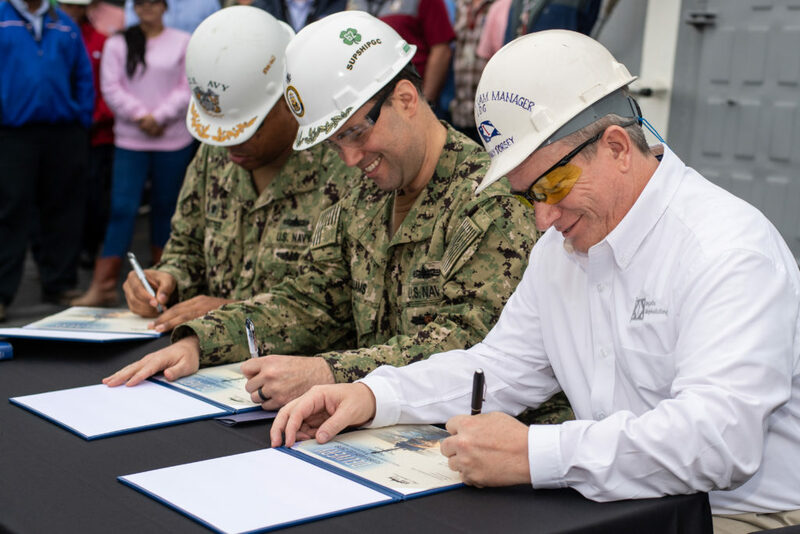 «Ingalls looks forward to continuing our strong legacy of providing the men and women of our naval forces with the capable and survivable warships they need and deserve», said Ingalls Shipbuilding President Brian Cuccias. «The LPD Flight II builds upon the significant investment that has been made in this platform to improve the capability and flexibility of our deployed Navy-Marine Corps team. LPD-30 will leverage a hot production line and further benefit from the investments we continue to make in our shipbuilders and facilities. We are honored to be a part of the team that will provide this next-generation platform today». LPD-30 is the evolution of the dock landing platform that strengthens the Navy and Marine Corps’ needs in future warfare. Utilizing the LPD-17 class’ proven hull, this LPD derivative is highly adaptable and, like the first 13 ships in the class, will be used to accomplish a full range of military operations – from major combat to humanitarian assistance and disaster relief. The ship’s versatility – from its well deck, flight deck and hospital facilities to its self-defense and survivability features – provides a viable platform for America’s global defense needs. Ingalls has delivered 11 San Antonio-class ships to the Navy and has two more under construction. Fort Lauderdale (LPD-28) will launch in 2020 and deliver in 2021; the keel for Richard M. McCool Jr. (LPD-29) will be laid later this year. Start of fabrication on LPD-30 is scheduled for 2020. The San Antonio class is a major part of the Navy’s 21st century amphibious assault force. The 684-foot-long/208 meter-long, 105-foot-wide/32-meter-wide ships are used to embark and land Marines, their equipment and supplies ashore via air cushion or conventional landing craft and amphibious assault vehicles, augmented by helicopters or vertical takeoff and landing aircraft such as the MV-22 Osprey. The ships support a Marine Air Ground Task Force across the spectrum of operations, conducting amphibious and expeditionary missions of sea control and power projection to humanitarian assistance and disaster relief missions throughout the first half of the 21st century. 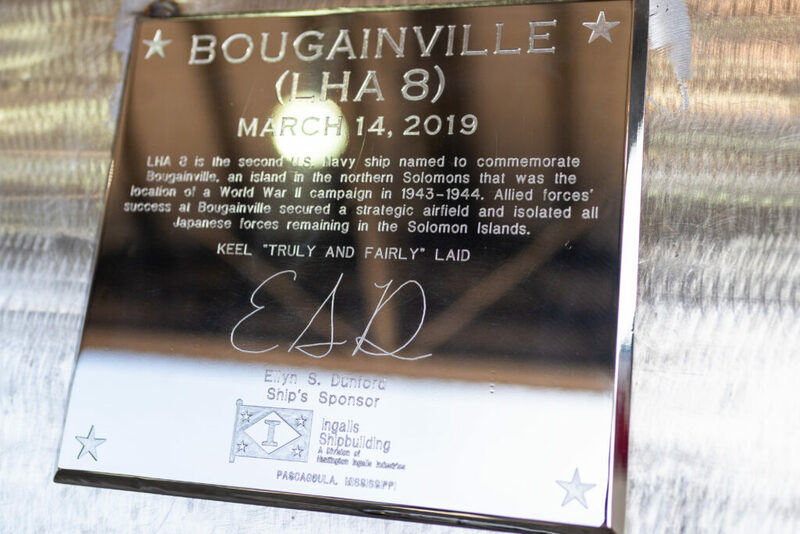 The keel of the America-class amphibious warship USS Bougainville (LHA-8) was authenticated during a ceremony at Ingalls Shipbuilding on Thursday, March 14. 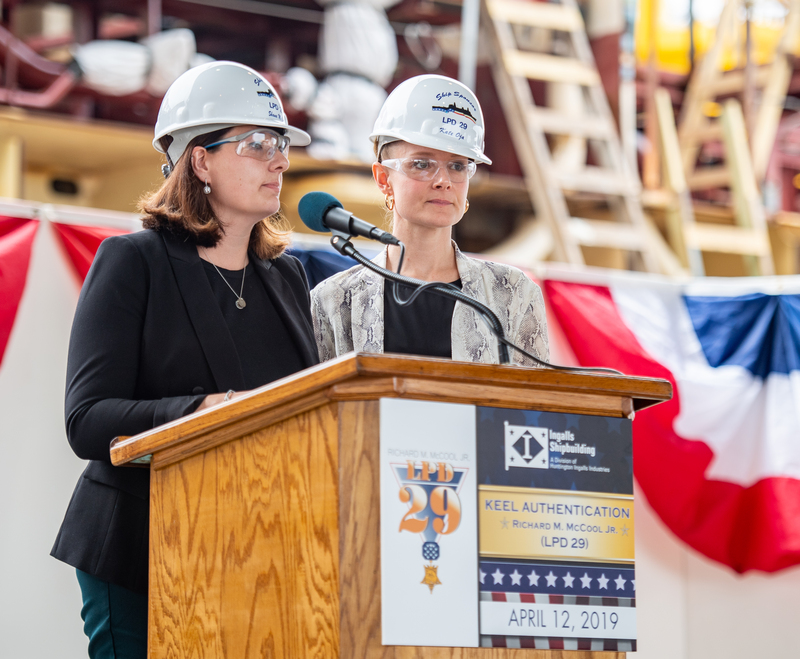 Ship’s sponsor Ellyn Dunford declared the keel «truly and fairly laid» after her initials were welded onto a plate. USS Bougainville (LHA-8) will be the second U.S. Navy vessel to bear the name Bougainville. The name commemorates the Bougainville Campaign that took place during World War II. During the campaign, which lasted from 1943 to 1944, Allied forces secured a strategic airfield from Japan in the northern Solomon Islands, helping the allies break the Japanese stronghold in the South Pacific. Ingalls is currently the sole builder of large-deck amphibious ships for the U.S. Navy. The shipyard delivered its first amphibious assault ship, the Iwo Jima-class USS Tripoli (LPH-10), in 1966. Ingalls has since built five Tarawa-class (LHA-1) ships, eight Wasp-class (LHD-1) ships and the first in a new class of ships, USS America (LHA-6). The second ship in the class, USS Tripoli (LHA-7) is currently under construction and USS Bougainville (LHA-8) is the third ship in the class. Ellyn Dunford, spouse of General Joe Dunford, 19th chairman of the Joint Chiefs of Staff, is the sponsor of Bougainville. A graduate of Simmons College, Mrs. Dunford worked as a physical therapist for close to 30 years. General and Mrs. Dunford have three children. Defensive weapons systems include .50 caliber/12.7-mm machine guns, The Phalanx, Sea Sparrow and Rolling Airframe Missile (RAM) anti-ship cruise missile weapon systems and decoy launchers. 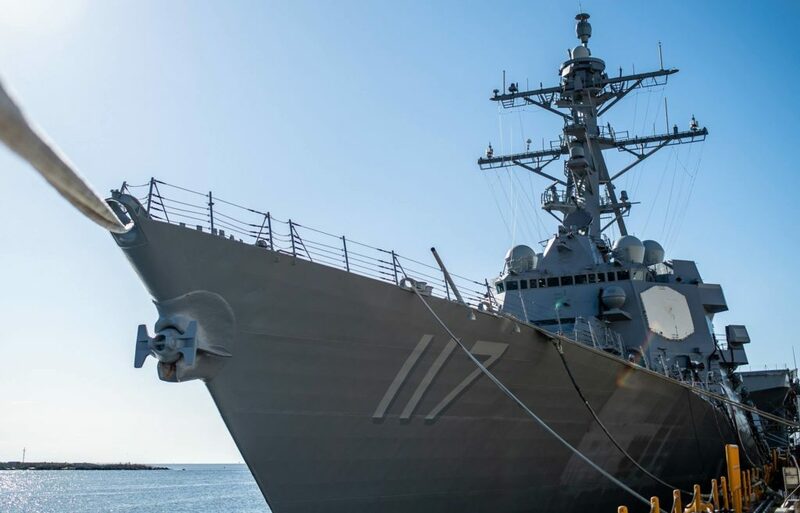 Huntington Ingalls Industries’ (HII) Ingalls Shipbuilding division delivered the Arleigh Burke-class guided missile destroyer USS Paul Ignatius (DDG-117) to the U.S. Navy with shipbuilders, ship’s force and representatives of Supervisor of Shipbuilding, Gulf Coast in attendance. The signing of the DD 250 document officially transfers custody of the ship from HII to the U.S. Navy. USS Paul Ignatius (DDG-117) is scheduled to sail away from the shipyard in June. «This event is the culmination of hard work and dedication by thousands of shipbuilders, industry partners from nearly every state, as well as our Navy SUPSHIP Gulf Coast shipmates who worked with us each and every day to ensure DDG-117 became a mission-capable ship», said George Nungesser, Ingalls’ DDG program manager. «Today, we deliver DDG-117 to the U.S. Navy – our 31st time to do this with an Aegis destroyer and well over our 80th time to deliver a Navy surface combatant on the banks of the Pascagoula River. It’s an honor to be a part of this great tradition». DDG-117 is named in honor of Paul Ignatius, who served as the 59th Secretary of the U.S. Navy, from 1967 to 1969. He made significant contributions during the administrations of presidents John F. Kennedy and Lyndon B. Johnson. Ignatius is a living namesake and currently resides in Washington, D.C.
Ingalls has now delivered 31 Arleigh Burke-class destroyers to the U.S. Navy. The shipyard currently has four DDGs under construction, including USS Jack H. Lucas (DDG-125), the first Flight III ship, which started fabrication in May 2018. The U.S. Navy’s newest aircraft carrier, USS Gerald R. Ford (CVN-78), closed out 2018 on a high note with the acceptance of the ship’s first Advanced Weapons Elevator (AWE), setting the tone for more positive developments in the year ahead. AWE Upper Stage #1 was turned over to the ship on December 21, following testing and certification by engineers at Huntington Ingalls Industries-Newport News Shipbuilding, where the ship is currently working through its Post-Shakedown Availability (PSA). The acceptance marks a major milestone for the ship and the Ford-class of aircraft carriers to follow. USS Gerald R. Ford (CVN-78) is the first Ford-class aircraft carrier and is the first new carrier design in over 40 years. 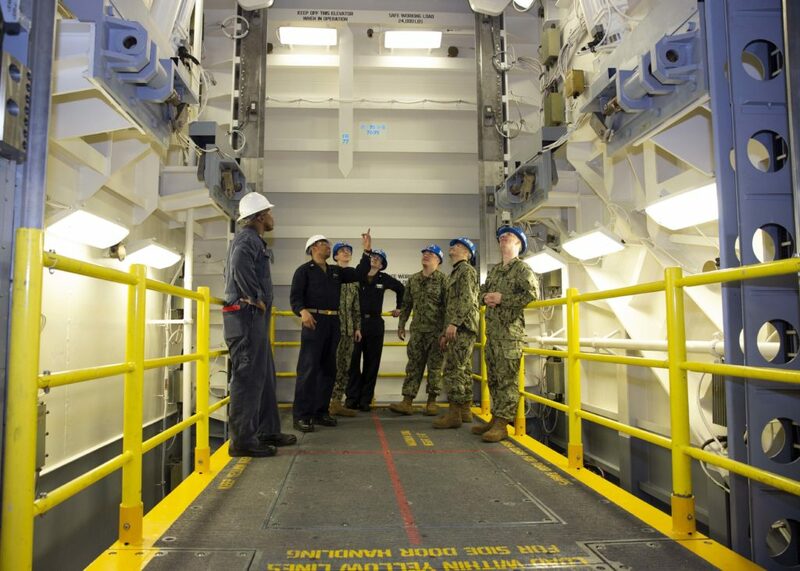 Unlike Nimitz-class carrier elevators that utilize cables for movement, the Ford class elevators are commanded via electromagnetic, linear synchronous motors allowing for greater capacities and a faster movement of weapons. The new design will allow the ship to be able to move up to 24,000 pounds/10,886 kg of ordnance at 150 feet-per-minute/45.7-meter-per-minute. This is in contrast to the 10,500 pounds/4,763 kg at up to 100 feet-per-minute/30.5-meter-per-minute on a Nimitz-class carrier. «This will allow us to load more aircraft faster, and in the long run, increase our overall sortie generation rates», said Lieutenant Commander Chabonnie Alexander, Ford’s ordnance handling officer. But aside from the advantages of the new AWE, the new ship design also offered a chance to streamline the overall movement and assembly of weapons to allow for even greater efficiencies. Ford features three upper stage elevators that move ordnance between the main deck and flight deck, and seven lower stage elevators that move ordnance between the main deck and the lower levels of the ship. Ford also features a dedicated weapons handling area between the hangar bay and the flight deck, on the 02 level, that eliminates several horizontal and vertical movements to various staging and build-up locations. This ultimately offers a 75% reduction in distance traveled from magazine to aircraft. An additional benefit of the ship’s design is a separate utility elevator that can serve as a dedicated elevator to move both ordnance and supplies, and also serve as a means to MEDically EVACuate (MEDEVAC) injured personnel from the flight deck to the hangar bay. This allows the 10 main AWEs and Ford’s three aircraft elevators to be dedicated to their primary missions of ordnance and aircraft movement during real-world operations. To keep up with the new technologies and radical changes that the AWEs offer, Ford Sailors recently completed newly developed familiarization, operations and maintenance training in Newport News to become better educated on how to work with and maintain the elevators. The crew is now conducting hands-on training where they will validate technical manuals and maintenance requirements cards against the elevator’s actual operation. Their feedback and observations will ultimately inform future Sailors how to properly and safely operate the elevators. Alexander said Sailors are now training with the elevator which will complement the classroom instruction they have received to this point. «Getting this elevator turned over to the ship and allowing our Sailors to get hands-on training on the elevator will help in two ways», said Alexander. «One, it will help in the training and understanding of the system itself, and two, to work out any bugs that remain with the system during our PSA». Though the first elevator has been accepted, work still remains on the remaining 10. Currently, all shipboard installation and testing activities of the AWEs are due to be completed prior to the end of Ford’s PSA, scheduled for July. However, some remaining certification documentation will be performed for five of the 11 elevators after PSA completion. According to Alexander, while there was sense of accomplishment and satisfaction in having the first elevator turned over, the team working on the elevators can’t rest on this single event. «We’re all 100 percent invested in this, but there’s still work left to do», Alexander explained. «We’re all one big team with the same goal in mind: to get these systems operational and turned over to the ship». «I think it was a greater sense of accomplishment to my Sailors that have been working on these systems for the last 4-to-5 years», he said. «To be able to finally push the buttons and watch it operate like it’s designed to do was a great feeling. Once these systems are proven, they are going to pay huge dividends for naval strike capability». 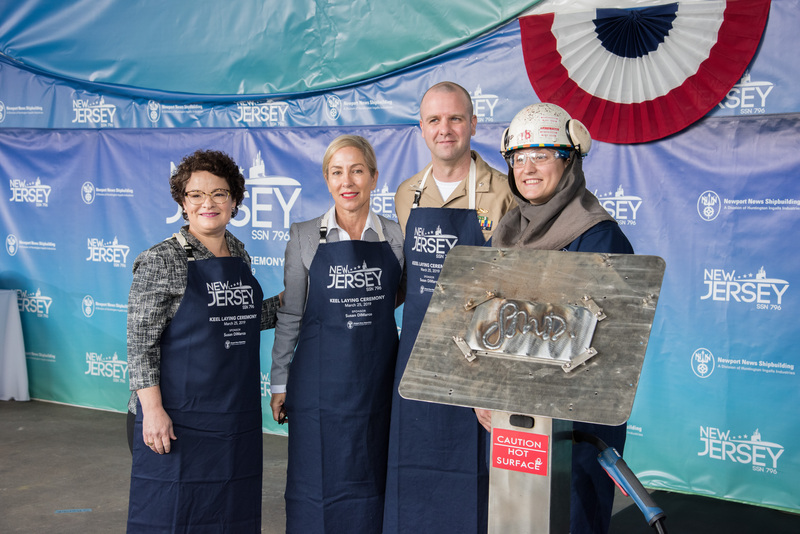 Secretary of the U.S. Navy Richard V. Spencer named a future Arleigh Burke-class guided-missile destroyer in honor of U.S. Navy Vietnam veteran, Navy Cross recipient, and former U.S. Senator from Alabama, Admiral Jeremiah Denton. «Admiral Denton’s legacy is an inspiration to all who wear our nation’s uniform», said Secretary of the Navy Richard V. Spencer. «His heroic actions during a defining period in our history have left an indelible mark on our Navy and Marine Corps team and our nation. His service is a shining example for our Sailors and Marines and this ship will continue his legacy for decades to come». In 1947, Denton graduated from the U.S. Naval Academy and served as a test pilot, flight instructor, and squadron leader, and developed operational tactics still in use, such as the Haystack Concept, which calls for the dispersing of carrier fleets to make it more difficult for the enemy to find the fleets on RADAR. On July 18, 1965, Denton was shot down over North Vietnam and spent nearly eight years as a POW (Prisoner Of War), almost half in isolation. During an interview with a Japanese media outlet, Denton used Morse code to blink «torture», confirming that American POWs were being tortured. He suffered severe harassment, intimidation and ruthless treatment, yet he refused to provide military information or be used by the enemy for propaganda purposes. In recognition of his extraordinary heroism while a prisoner-of-war, he was awarded the Navy Cross. Denton was released from captivity in 1973, retired from the U.S. Navy in 1977 and in 1980 was elected to the U.S. Senate where he represented Alabama. Arleigh Burke-class destroyers conduct a variety of operations from peacetime presence and crisis response to sea control and power projection. 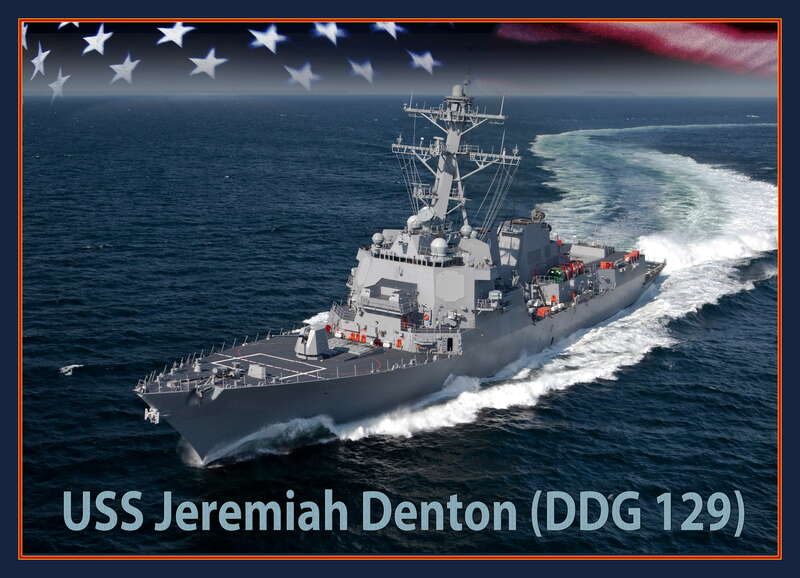 The future USS Jeremiah Denton (DDG-129) will be capable of fighting air, surface and subsurface battles simultaneously, and will contain a combination of offensive and defensive weapon systems designed to support maritime warfare, including integrated air and missile defense and vertical launch capabilities. The ship will be constructed at Huntington Ingalls Industries’ Ingalls shipbuilding division in Pascagoula, Mississippi. The ship will be 509 feet/155 m long, have a beam length of 59 feet/18 m and be capable of operating at speeds in excess of 30 knots/34.5 mph/55.5 km/h. Secretary of the Navy Richard V. Spencer named a future Arleigh Burke-class guided-missile destroyer in honor of U.S. Senator Ted Stevens, who represented Alaska from 1968 to 2009. «Senator Stevens was a staunch supporter of a strong Navy and Marine Corps team who served our nation with distinction as a pilot during World War II, and later as a Senator of Alaska», said Secretary of the Navy Richard V. Spencer. «I am pleased that his legacy of service and dedication to national security will live on in the future USS Ted Stevens (DDG-128)». Stevens served as a pilot in the Army Air Corps from 1943 to 1946 and was awarded the Distinguished Flying Cross before being discharged in 1946. Stevens was elected as a state representative in Alaska in 1964, re-elected in 1966, and in 1968 he was appointed to fill a vacancy in the U.S. Senate. In 1970, Stevens was elected to the seat in a special election and was subsequently re-elected five times. He left office in 2009 as the then-longest serving Republican U.S. Senator in history. Arleigh Burke-class destroyers conduct a variety of operations from peacetime presence and crisis response to sea control and power projection. 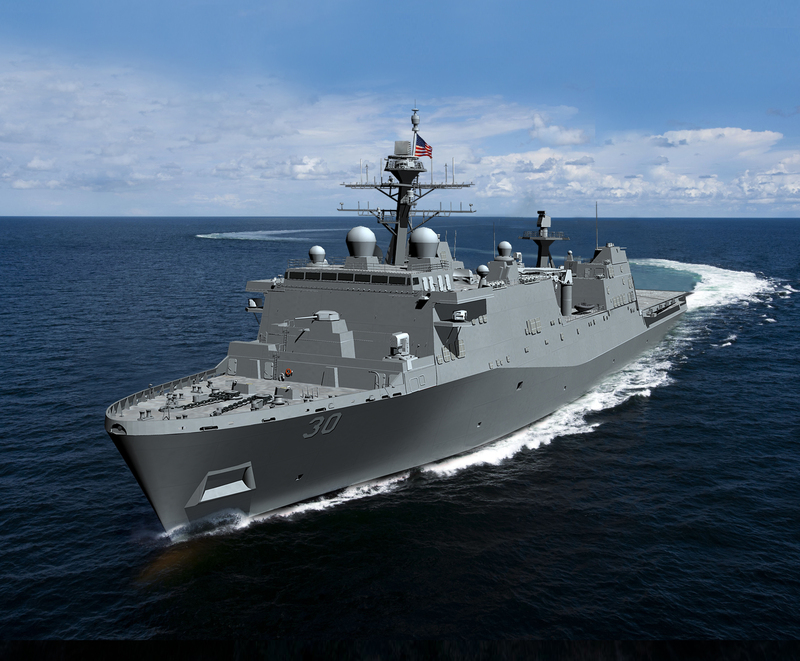 The future USS Ted Stevens (DDG-128) will be capable of fighting air, surface and subsurface battles simultaneously, and will contain a combination of offensive and defensive weapon systems designed to support maritime warfare, including integrated air and missile defense and vertical launch capabilities. Huntington Ingalls Industries’ (HII) Ingalls Shipbuilding division has received two fixed-price incentive contracts from the U.S. Coast Guard to build two additional National Security Cutters (NSCs) for the U.S. Coast Guard. The contract values for the a 10th and 11th ships in the program are $468.75 million for NSC-10 and $462.13 million for NSC-11. «This additional funding for two NSCs is a great accomplishment on which to end the year», said Ingalls Shipbuilding President Brian Cuccias. «The outstanding work being done by skilled men and women of Ingalls, as well as the recognition by Congress and the U.S. Coast Guard as to the important contributions these ships make to our nation’s defense, are the reason for this success. These ships provide capable assets that our Coast Guard customer uses to perform essential homeland security missions, and we look forward to delivering two more quality NSCs to help with this important work». Ingalls has delivered seven NSCs, the flagships of the Coast Guard’s cutter fleet, designed to replace the 12 Hamilton-class high-endurance cutters that entered service in the 1960s. 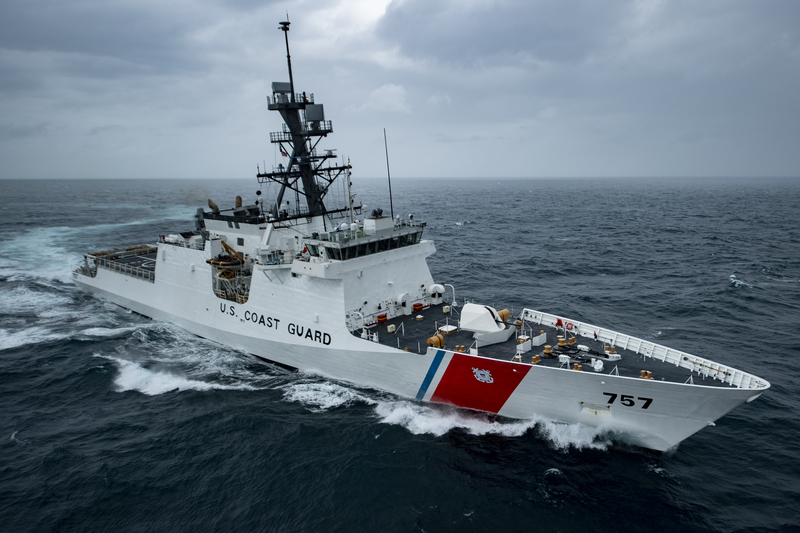 The seventh ship, USCGC Kimball (WMSL-756), will be commissioned in Hawaii on January 19. Both the eighth ship, USCGC Midgett (WMSL-757), and the ninth, USCGC Stone (WMSL-758), are currently under construction at Ingalls. 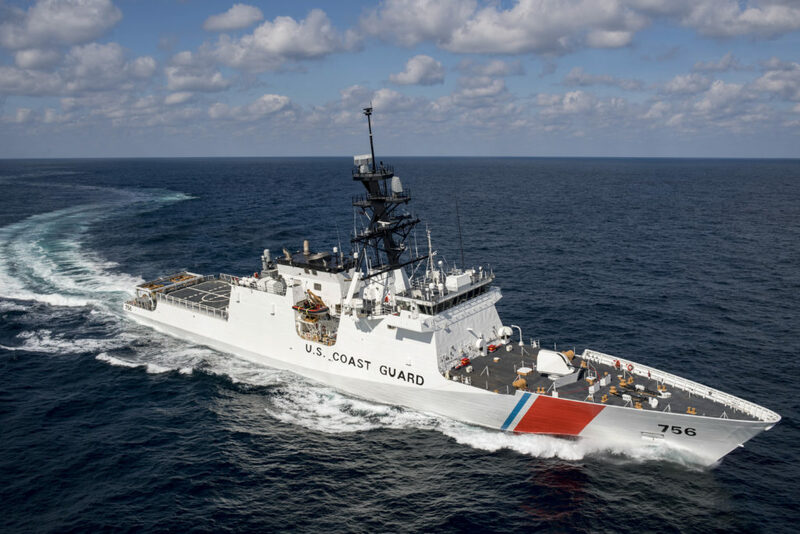 USCGC Midgett (WMSL-757) is scheduled for its first set of sea trials in the first quarter of 2019. USCGC Stone (WMSL-758) is scheduled to launch in 2019. NSCs are 418 feet/127 m long with a 54-foot/16-meter beam and displace 4,500 tons with a full load. They have a top speed of 28 knots/32 mph/52 km/h, a range of 12,000 NM/13,809 miles/22,224 km, an endurance of 60 days and a crew of 120.